These beautiful knee pads were worn by the Goddess Artemis's High Amazon Guards. 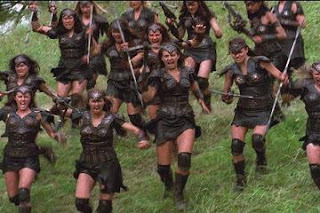 They were spotted in Xena Season 5 episode "Eternal Bonds" I also attached a shot of my knee pads. My hamster Autolycus couldn't resist stepping into the spotlight.